The Loud Americans: MS150 Year 22!!! Day 0 – ride to Duluth = completely uneventful with the exception of road construction on HWY 35W, I highly suggest you avoid that route to Duluth until you get past Hinckley, man was it slow! But, we connected with our friends (Wendy, Chris, Ned & Allen), chatted, napped and relaxed. We had dinner at Lil’ Angie’s and a walk on lakeshore (long standing pre-ride tradition of Mexican food and walk). Duluth was warm and gorgeous! Day 2 – no need to beat the heat, it was the rain that had us a bit worried. We were again up at 5am, on bikes at 6am and rode RIGHT through a rain storm (with thunder/lightening in the far distance) at about 8am. The wind then proceeded to pick up and by the time we finished (~ 12:15) it was getting hot and the wind was blustering between a due east and a headwind at about 15-20 mph. Against the wind and uphill is NOT my favorite way to end the ride. 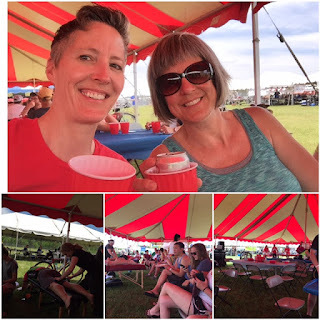 BUT … We finished and felt good! Fundraising – this weekend saw a few BIG donations. Thank you to the culprits, you know who you are and I appreciate it!!! This brings me to $2785 – just $215 shy of $3,000. I’d love to hit $3,000 as it comes with extra privileges and perks (like my name on the sign in the attached photo and special parkingJ) If you haven’t given yet, there is still time!! Please use the link below and help push me over $3,000!! Stats - My aunt asked, ‘how much do you think you’ve raised over the years?’ - by very rough estimates, I think I’m at about $20,000. AND … If I look at what Ned, Allen, Wendy and I raised – together – this year alone we’ve raised ~ $12,000. Woo Hoo!! The ride had 3,900 riders and was hoping to raise > $3m. This doesn’t include the massive numbers of volunteers and staff that make the ride so easy for us. 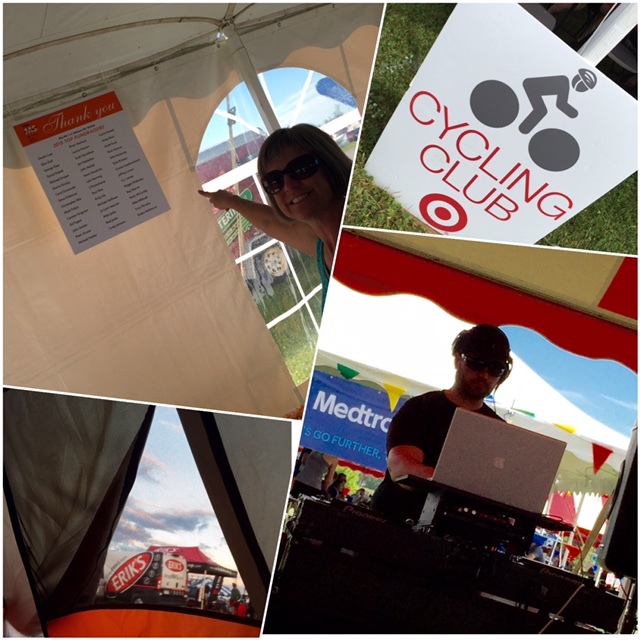 A BIG THANK YOU to Tiffany, Daon and Danielle for organizing the Team Target tent. They had wonderful food, beer, milk, massage therapists, a DJ and chiropractors. It’s a TON of work and they did it with a smile, in the heat - THANK YOU, it means so much to know people are taking care of you after the long ride! !